From 1910 to 1961, this was the site of the Beth Israel Synagogue. Orthodox Judaism dictates that Jews must live within walking distance of their synagogue. While there was never an exclusively Jewish neighborhood in Kingston, most Jewish residents were congregated within close proximity of this location up until the 1950s. At the turn of the twentieth century, Kingston was home to several groups of Jews who worshipped amongst themselves in little rooms (shtiebls). Then, in 1908, at least three groups of Jews in Kingston—including the Hebrew Congregation of Kingston, and the Sons of Jacob—were amalgamated through the diplomatic efforts of Isaac Cohen. He promised to see to it that a synagogue was erected for the benefit of the whole community if the various groups could see their way towards overcoming differences and combine. After purchasing land here on Queen Street, the Jewish community lacked the necessary financial resources to construct the building. It is worthy of note that an estimated one-fifth of the cost was underwritten by the non-Jewish citizens of Kingston. The largest contributor, incidentally, was also the city’s largest industrial concern: The Kingston Locomotive Company. The elder statesman of the Jewish community, Simon Oberndorffer, laid the cornerstone in 1910. It was constructed in brick on a stone foundation to the designs of the architectural firm Power & Son, and featured a buttressed tower, capped with an ogee cupola or small dome, on each side of the main façade, which had two entrances. The main round-arched windows had small diamond panes. The effect was one of quiet dignity but with an exotic touch in the domes, which echo the Moorish style. 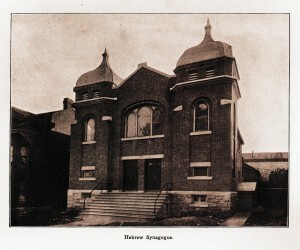 It was a modest version of Holy Blossom Synagogue of 1897 in Toronto. The old synagogue was demolished, when it was decided to build a new one on Centre Street. The latter opened in 1961. In 1974, the Corporation of the City of Kingston dedicated the Samuel Springer Memorial Parking Lot (for more on Sam Springer, please see the “stop” at Princess and Wellington, now TD/Canada Trust).